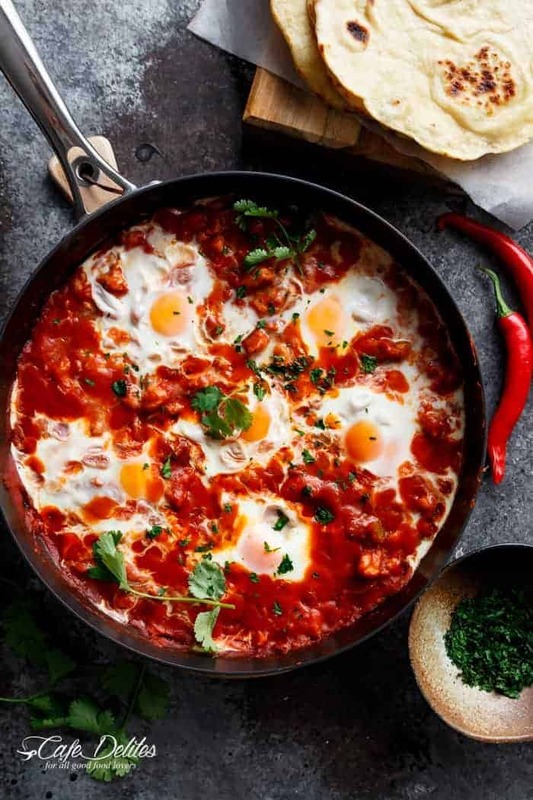 There are so many different variations of Shakshuka, (also known as Menemen in Turkey); a dish consisting of eggs poached in a rich and spicy tomato sauce. With so many different recipes out there to choose from different parts of the globe, from Tunisia to Israel, I went with one sent to me from a reader all the way over in Morocco, (thank you Haytam)! I mean, the images were enough to make me hungry at midnight! Feeling extra productive, I paired it up with a super easy homemade flatbread that was out of this world good to soak up all that sauce! But leave out the bread and you have an epic low carb meal in less than 30 minutes. As usual though, I broke the rules of Shakshuka tradition and made this one with ground sausage. 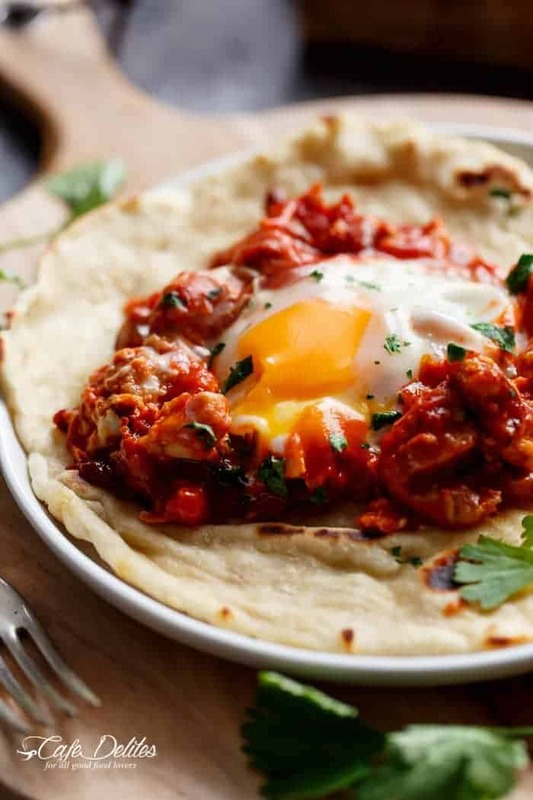 Being from Spanish decent, I merged the two and found bliss, because eggs and sausage in a fiery tomato sauce is an incredible way to wake up. Or lunch or brunch. Or dinner, like we did. Incredibly easy to make, start off by frying onion and garlic until fragrant. Add the sausage and fry until golden. Next, add peeled and chopped whole tomatoes plus your spices. While my tomatoes simmered for 15 minutes into a thick and rich fiery sauce, I went off and made my flatbread, which I will post in the next few days. You’re welcome. Once the sauce is ready, make small indents in the sauce where your eggs will sit and simmer and mix in that incredible sauce. Cover with a lid (no need to turn on any oven), and gently simmer until the eggs are cooked to your liking. We love ours runny. 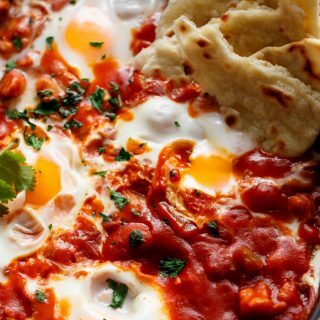 Imagine: thick, runny yolk meets rich tomato sauce. Oh, this was some good food. See what I mean? It’s calling for fresh, pan fried flatbread. Just remember to bring some extra water to the table. And prepare to visit North Africa and the middle east. 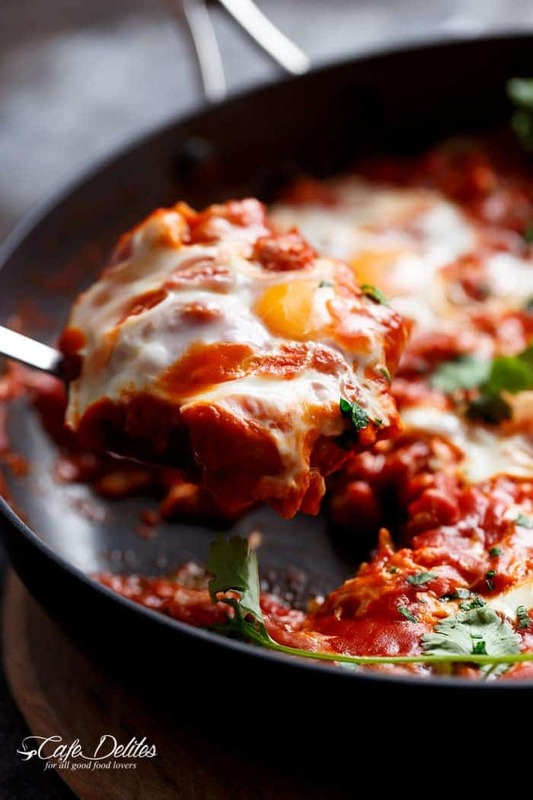 And if you want to experiment with more baked eggs recipes, I have a killer Huevos Rancheros Tortizza (where Tortilla meets Pizza), or Hashbrown Egg Cups that are low carb. 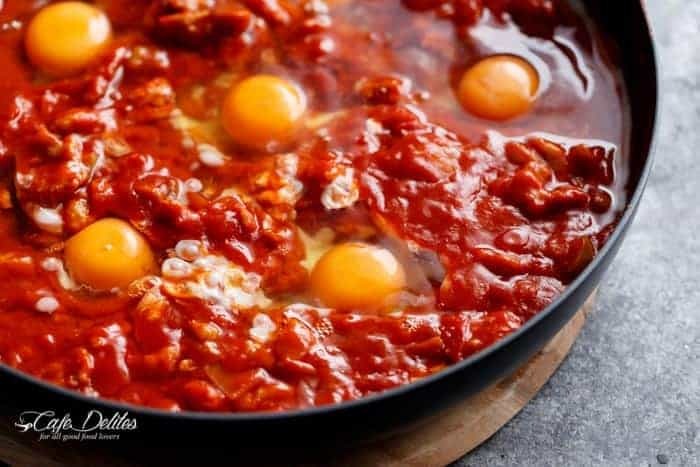 Eggs In Tomato Sauce (Shakshuka): thick, runny yolk meets rich tomato sauce. This is some good, fiery comfort food! Weight Watchers Smart Points: 6! 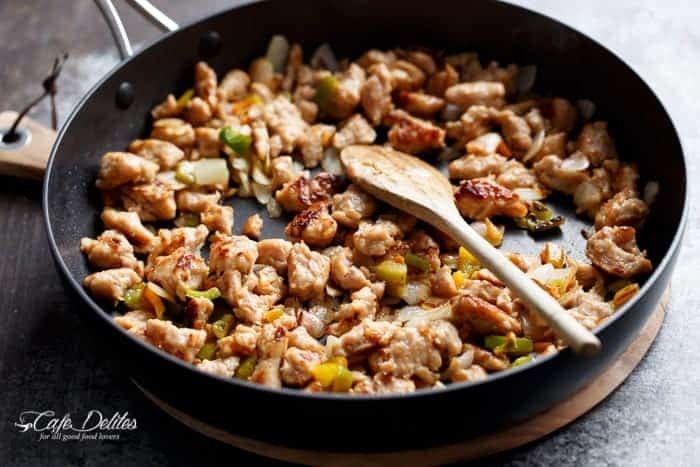 Heat oil in a large non stick pan or skillet over medium heat. Add onion and cook, stirring occasionally, until soft and transparent. Add garlic, bell pepper, ground sausage, cumin, paprika and chilli; cook, stirring occasionally, until garlic is soft and fragrant. 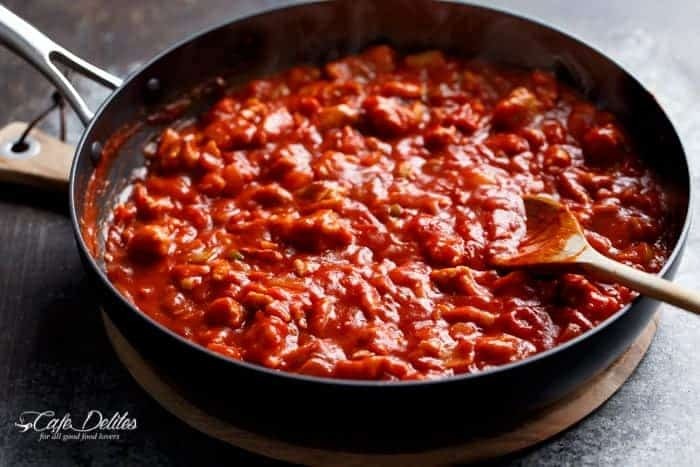 Add tomatoes and their juice into the pan with the tomato paste. Reduce heat to low and allow to simmer, stirring occasionally, until thickened slightly (about 10-15 minutes). Season with salt to taste. Evenly distribute small indents into the sauce with a spoon and crack each egg into them. Cover pan with lid and cook until yolks are just set (it takes about 5 minutes). Using a spoon, baste the whites of the eggs with the tomato sauce, being careful not to disturb the yolk. 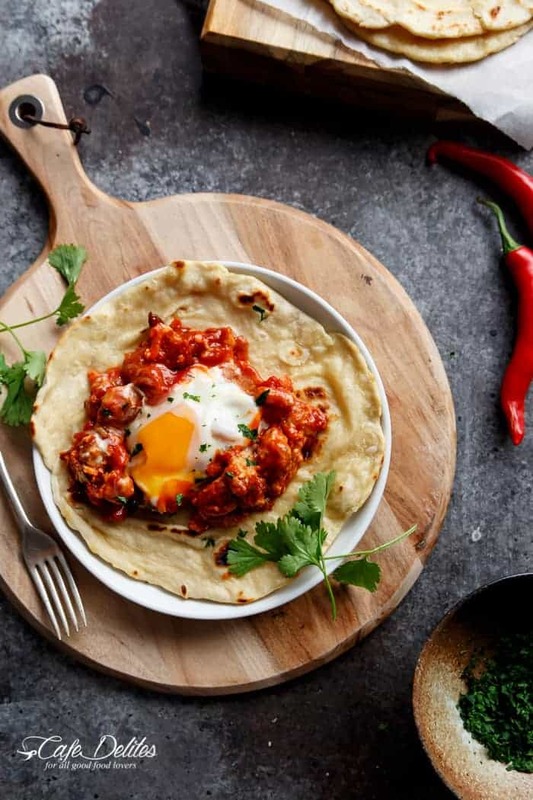 Sprinkle shakshuka with parsley (or cilantro) and serve with flatbread, for dipping. *I used plain, lean chicken sausages for this recipe, but you can use beef or turkey. Like the Italian eggs in purgatory. Nice spin on the Spanish ingredients! Wow, first time here and you already got me hooked! 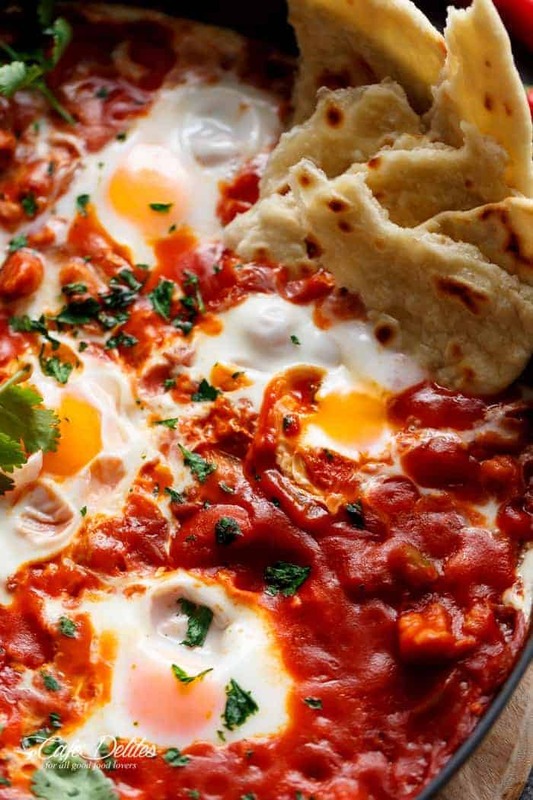 I didn’t know this was Arabic food, but it reminds me so much of two dishes my Southern Spanish family love: one is sopa de tomate (pretty much you’d substitute the sausage for stale bread, and that’s it), and the other is huevos a la flamenca, in which you’d change the sausage for chickpeas and then top the egg with bits of Serrano ham. You can also serve it with picatostes (deep fried bread). Hey! This meal looks amazing and I can’t wait to make it. I was just wondering what the best way to reheat this would be? Or would it better to just make the sauce and reheat with a fresh egg each time? Hi Donny! Thank you 🙂 It would be best to make the sauce first and reheat whenever you need it with the eggs 🙂 I wouldn’t reheat it as you’ll lose the runny egg yolk. Beautiful and delicious! 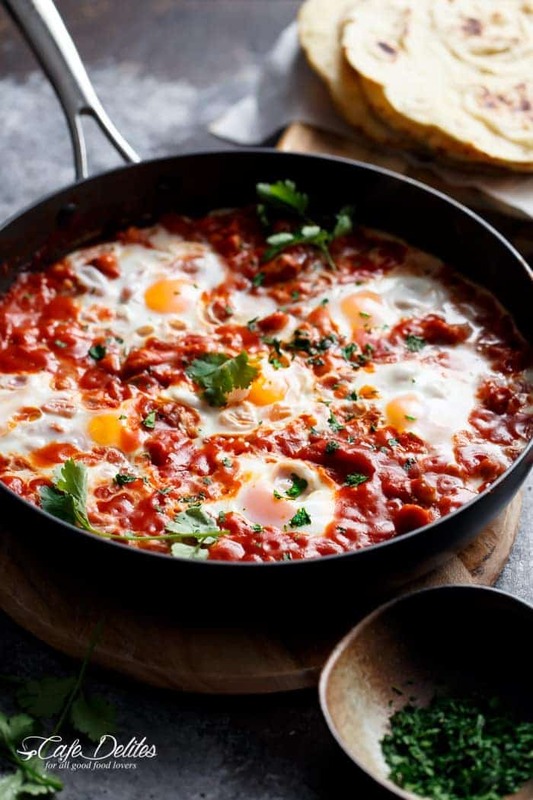 I love all sorts of shakshuka (and menemen of course, as a Turkish eheh). I’m so happy you approve Asli! Thank you for commenting…it means so much to me! My husband would LOVE this recipe. Pinning!